A wolf was eating the meat of his kill when a tiny bone stuck in its throat. The wolf couldn’t swallow any food and it feels uncomfortable in its throat. The wolf began to groan loudly about it and seek to find someone who can help it to take away the bone. No one dares to help the wolf because they are scared that the wolf might eat them up. Finally a crane agreed to help the wolf. 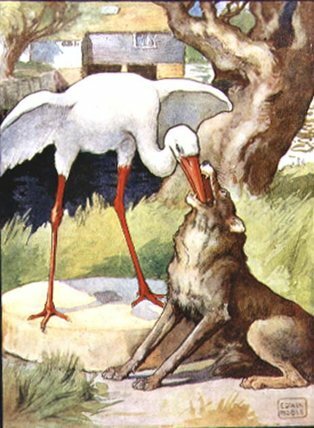 The crane told the wolf to lie down and open its mouth as big as it could. The wolf listens to the crane. It lies down on the ground and open its jaw wide and big. Then the crane put its head into the mouth of the wolf and took the bone out from the wolf’s throat. The wolf feels very happy. The wolf doesn’t feel any more discomfort in its throat and it can swallows food again. Don’t trust the word of a person who cannot be trusted.